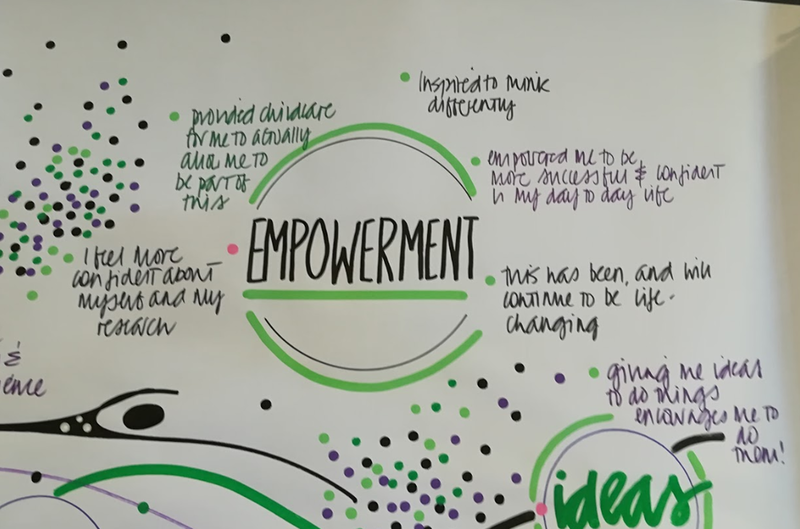 If I’d been told three months ago that assisting in a programme’s social media would lead to something empowering and amazing, I probably would have laughed, or in the very least, raised an unconvinced eyebrow. Ditto if I’d been told I’d find myself sitting on a station platform in Croy, trying not to cry over a card with a cartoon Elvis Presley adorning the front. And yet, one day after the end of the final Ingenious Women weekend, I find myself having spent three weekends surrounded by some of the most inspirational women I have ever had the pleasure to meet, learning, having some extraordinary conversations (knickers, anyone?! ), and sharing it all on Twitter (#IWScot2018). I’ve had some fantastic opportunities and attended some extremely useful training throughout my academic career, but Ingenious Women will be something I carry with me well beyond PGR life-and I wasn’t even an intended recipient! The final weekend began catching up on the past few weeks, and the introduction of graphic artist, Vanessa Randle (@thinkingv). Whilst I was documenting the weekend in hashtags, Vanessa was capturing the Ingenious Women and their conversations in stunning, graphic form. Suffice it to say, once the weekend was over, there were discussions about the future of the tower and larger image Vanessa created! Plenty to be immodest about! 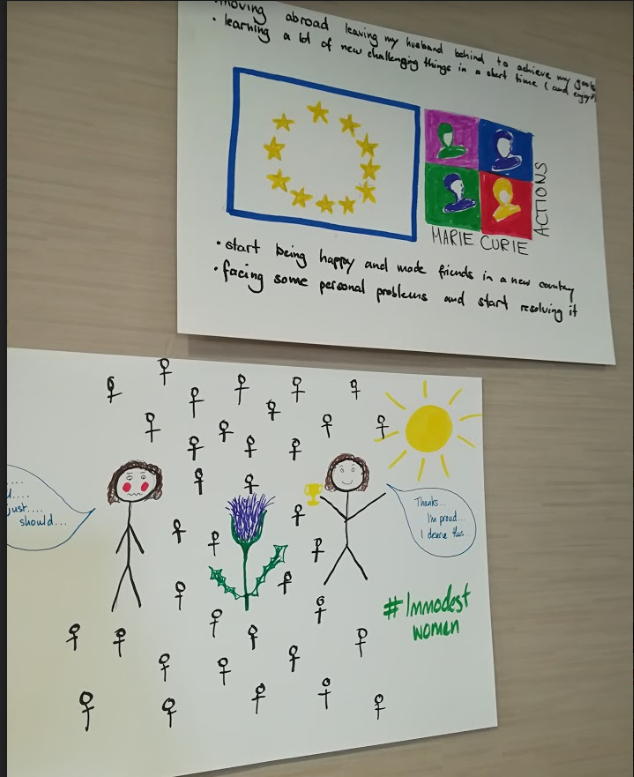 Inspired by #ImmodestWomen, we kicked off by harnessing the creativity established during the first Ingenious Weekend, illustrating the accomplishments and events that had occurred since our last meeting in May. Unsurprisingly, the Ingenious Women cohort have a multitude of things to be immodest about, and starting the weekend sharing and shouting about it both set up the weekend’s uplifting and empowering tone, but also captured the overall feeling of the three weekends. It was a privilege to share in moments and the successes of so many talented women, and I’d defy anyone not to be inspired. As I approach the end of my PhD and this internship, I am now labelling myself an “#ImmodestWoman In Training”, and have made a commitment to myself to stop downplaying myself, my work, and my achievements. I’m eradicating “I just am/ do/did x” from my vocabulary, and I’d urge other PGRs to do the same. We have a lot to be immodest about. A confession: prior to Ingenious Women, I was decidedly not a fan of thinking about cash or careers (one of the many effects of growing up in t’North and a somewhat unenthusiastic careers advisor during my GCSE years), but Sara and Janet made the prospect of updating my CV appealing. 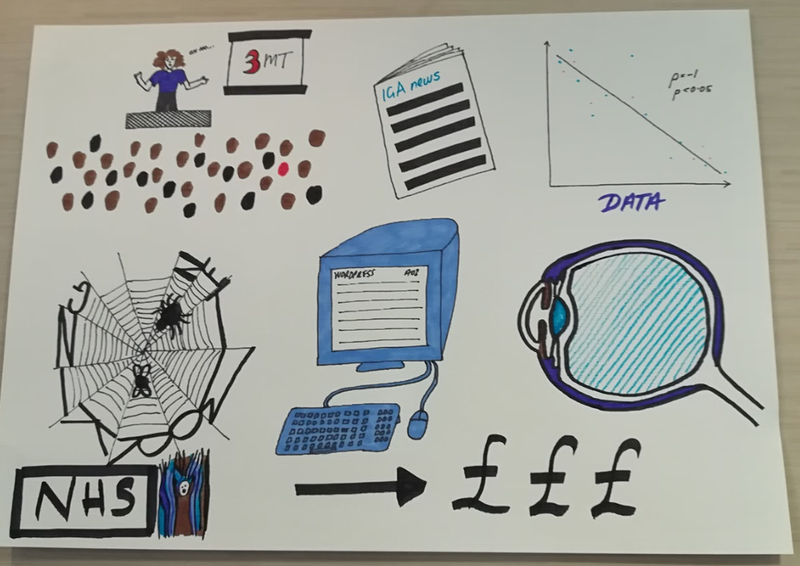 Janet asked us to consider the stories we wanted our CVs to tell about us, noting the frequency with which we often update our CVs in a hurry and simply add reams of new information. Whilst the cohort swapped and studied each other’s CVs- who better to offer guidance than the impressive, supportive colleagues around you?- I decided that once the weekend was over, I’d build a new CV (likely telling the story of someone with a mild addiction to hashtags) and ask those I admired for their assistance. Again, it really hit home when Janet and Sara pointed out that we have no problem sending our hastily updated CVs away to future employers, but feel nervous about sharing it with friends and colleagues. Time to make a change and start telling better, more accurate stories. 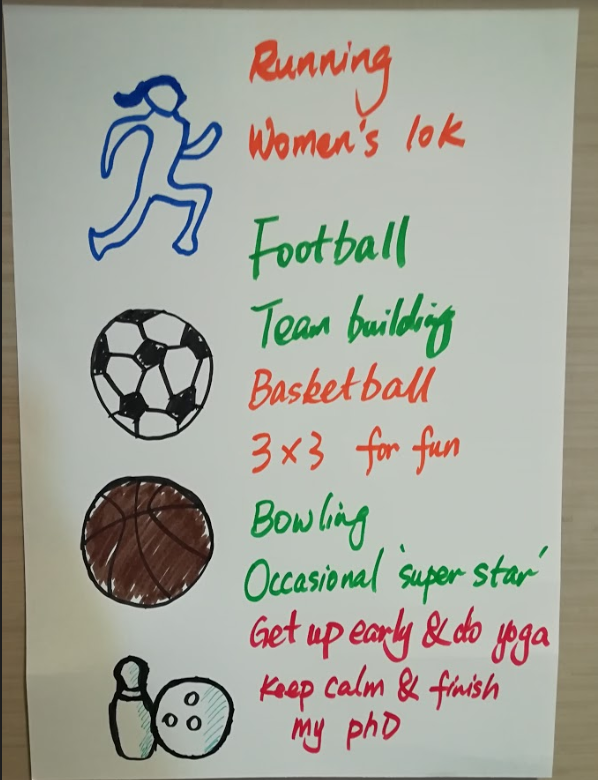 In previous posts, I’ve tried to cover the content of each weekend: Creativity, Cash… But I also want to mention the many ingenious women of Ingenious Women. I am not a woman in STEM, and though I spent a lot of time sneaking around the room and cheekily snapping pictures of notebooks and knickers to tweet, I was welcomed into the cohort with open arms- and for that I will be eternally grateful. I’m not going to go all #blessed on you, blog readers, but I am getting a little watery-eyed as I type this. I honestly can’t begin to express how uplifting and inspiring it has been to be able to spend weekends surrounded by these wonderful women, and to now be part of the Ingenious Women network (or rather, "Ingenious Knicker Machine"!) is beyond anything I could have imagined when I arrived at the first weekend. I’m excited for the future, and the many incredible things they will achieve together. One of the many themes of Ingenious Women was of “throwing down the ladder” to other women, and I certainly feel as though a ladder has been thrown down to me. 1. Be immodest. Be proud and shout about everything you’ve accomplished, whether it’s a small win like making the bed in the morning, or using that well-earned title of ‘Dr’ one day. 2. Find and surround yourself with a powerful network of inspirational and supportive people who uplift and empower you, and for whom you can throw ladders down to too. 3. If your manager asks if you might be available to assist in a programme’s social media, consider saying yes. You never know what opportunities, or Ingenious Women you’ll find beyond that hashtag. What do you have to be #immodest about? Is there anyone who has thrown a ladder down to you, or someone you can do that for? Are there any experiences or training that have transformed your PGR experience? As ever, let us know via the comments or on Twitter! Cia Jackson is a 3rd year PhD candidate in Comparative Literature, researching the portrayal of fangirls and power in DC's Harley Quinn and Batgirl comics.